A female model poses for a fashion photography shoot in the Colorado outdoors. She sits comfortably in the middle of a pile of multi-colored rugs with various geometric patterns. She is dressed appropriately for the chilly weather in a bright red hat, a white sweater, a brown fur vest, and knee-high leather cowboy boots tucked into skinny blue jeans. She is also holding onto a printed clutch bag. Her blonde hair has been styled in messy curls and although she is sitting sideways, she is looking straight at the camera. Her outfit is coordinated with the colors of the rugs as the shades match perfectly. The background is a great contrast, consisting of what looks like a run-down or abandoned shack in the middle of the woods. 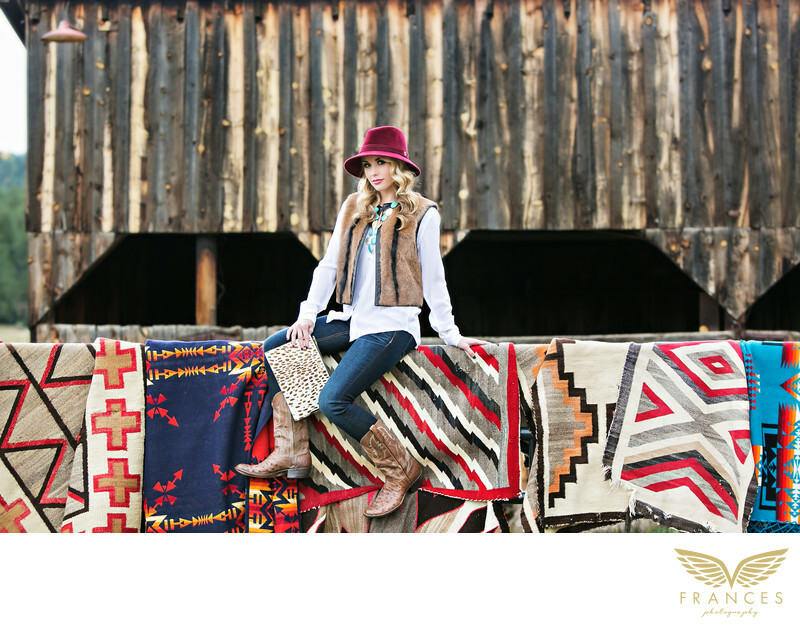 The bright colors against the neutral background make the rugs and her clothing really stand out in the photograph.